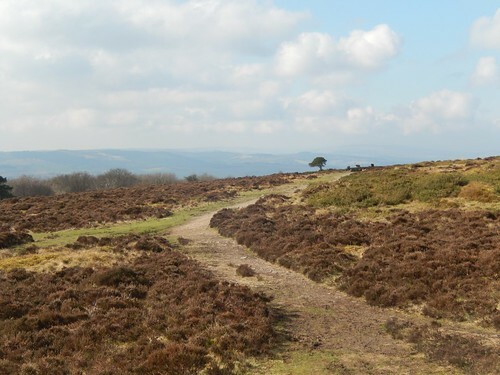 With an eye on completing a successful circuit around the southern half of the Quantock Hills last month, I headed deeper down in to Somerset for a reasonable walk. 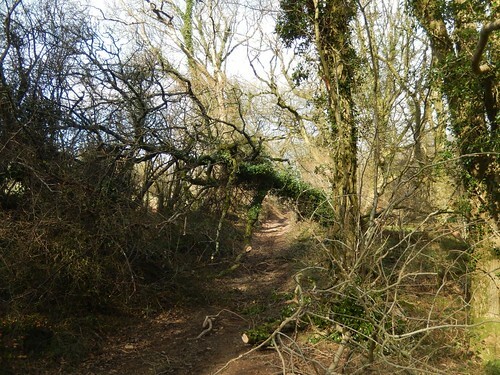 Previous walks have led me to the discovery of several obstructed and inaccessible footpaths towards the end of each walk… Would this outing deliver the same outcome? Officially, we’re within the last leg of winter. 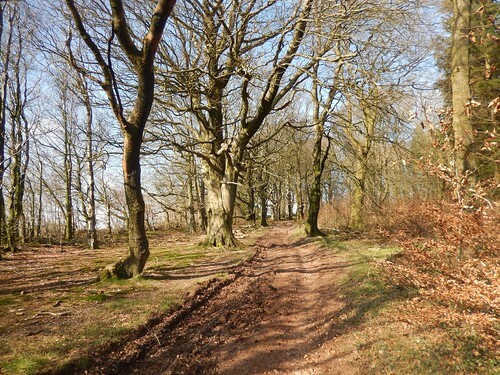 From Fyne Court, where I began this walk; you could look around to see the early and undeniable signs of spring. 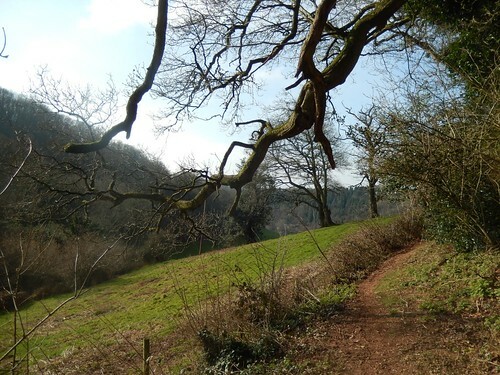 From the edge of Broomfield then, I very quickly joined the Quantock Greenway heading west – which is a familiar commodity of my walks in this part of the region. All around me, the air was cold. Yet it certainly felt as though a change within the seasons was underway. 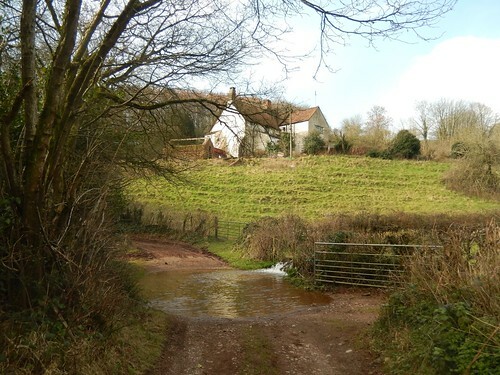 On the approach to Raswell Farm and a road crossing ahead of a fiendish climb, I found the familiar ford to be at least twenty-five percent larger than its usual size. 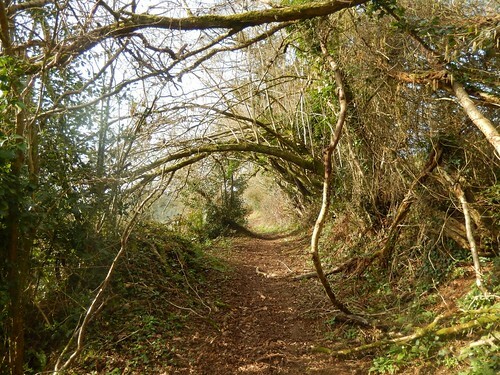 As I moved on up towards Ivyton Farm, I turned right, leaving the Greenway to join the MacMillan Way West. 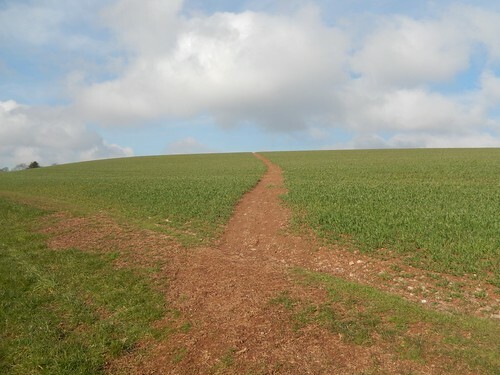 This is a route I attempted to follow on one occasion last year – but in the heights of the summer, with crops nearing eight-feet tall all around me, it was almost impossible to determine the right of way and so, I turned back, to take an alternate path. In winter, of course, we don’t have to worry about towering crops as much. 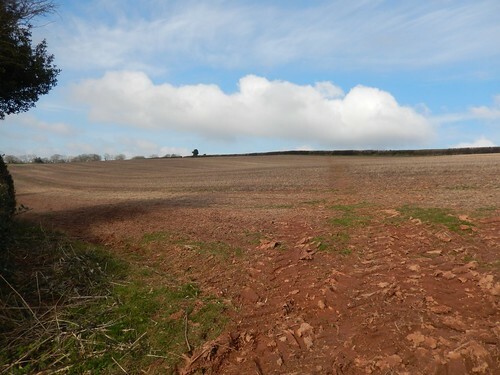 In the next field, the path was as wide and clearly defined as I could remember from another walk in 2015. 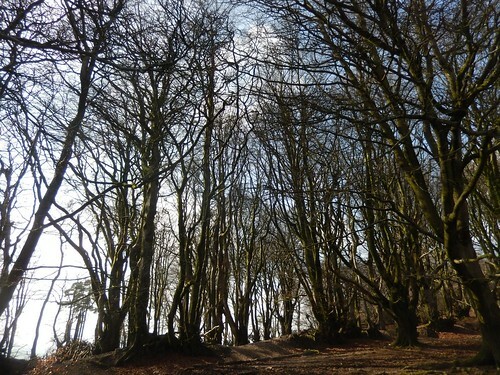 Climbing up through the woods, I was making good progress on my way towards the top of Cothelstone Hill. Close to the one-hour mark, it always seems to mark the perfect stop point, whichever path I take leading up to it. 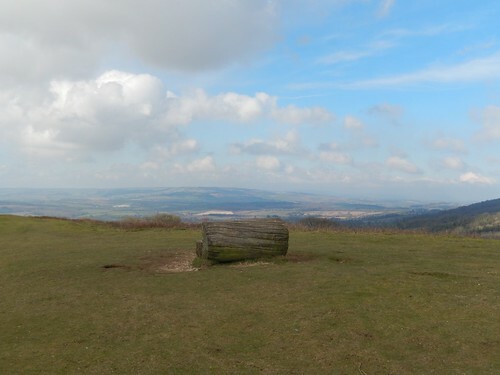 At the top of Cothelstone Hill, I always seem to struggle in finding the views that accompany the highest point. A cluster of trees define it. Walking to the very top of the hill should be simple, right… Hopefully, next time, I’ll be able to reach it without having to contour the hillside first of all. 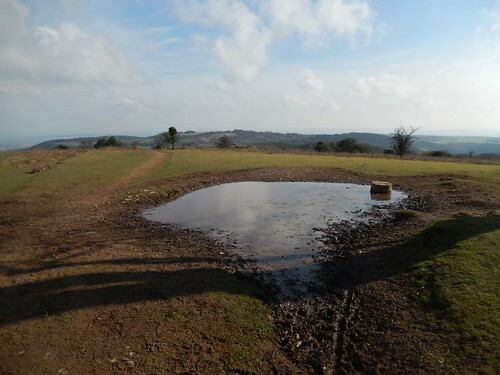 This landscape was sadly lacking in the gathering of wild horses who usually adorn this space in the summer months. But I did find this partially-frozen pond. On such a sunny day, it was quite the surprise. But the wind was persistent and chilling. I made a very brave effort to sit down and eat for ten-minutes, having failed to find an appealing location that also offered shelter from the breeze… I ended up pouring a full cup of Earl Grey down my right trouser leg. It would’ve been bad enough in dark trousers but I happened to be wearing white. Now tainted with the pooling of tea. 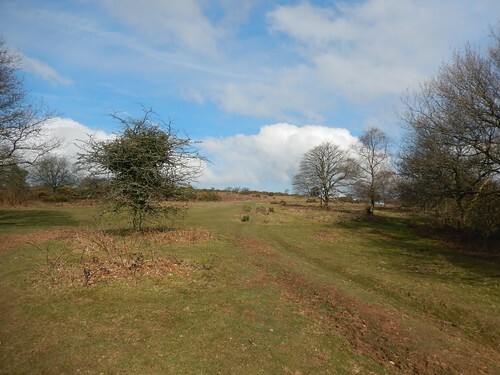 Heading for the road that would lead me along the MacMillan Way and then on to Lydeard Hill, I got very overconfident and simply walked without carefully consulting my map. It was only after I realised I was heading downhill, with views of my destination veering off and up to my right, that I had to concede in my error. But, with a pair of fellow hikers puffing up the hill towards me, I wasn’t about to publicly do an about-turn and physically admit to my mistake, with a map latched on to my waist and hydration bladder tube slung over my shoulder… After overtaking the two women and continuing further downhill, I waited until they’ve moved beyond my vision before redirecting my stride. 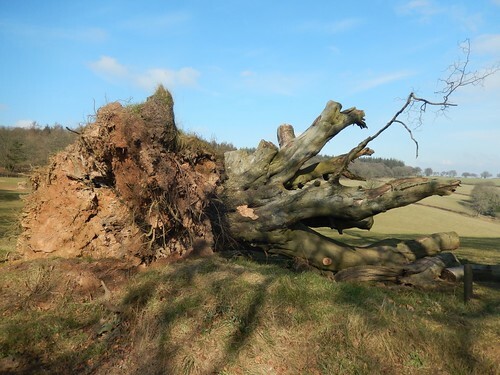 I did pass this large fallen tree on the correct road to the hill but I think it’s one I’ve passed before and not, perhaps, a victim of our recent winter winds. In fact, there weren’t many signs at all of fallen trees or chainsaw action on this walk. 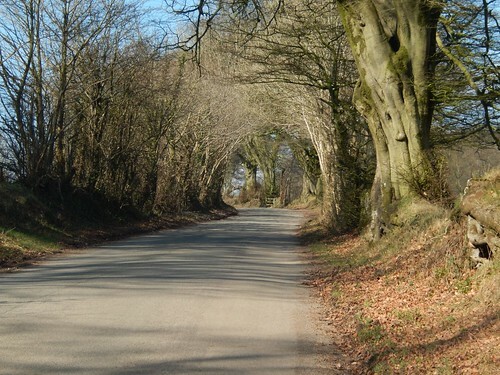 Approaching Lydeard Hill, there were abandoned cars lining up along the road near its junction with a route in to West Bagborough. 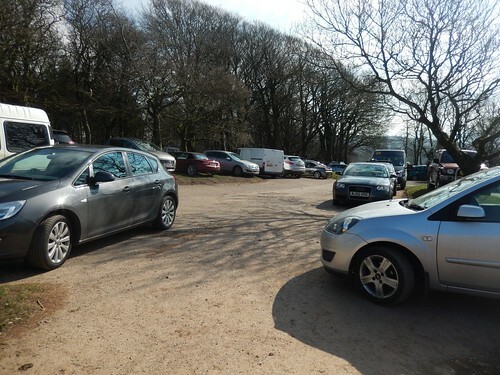 It was only as I continued my walk up and in to the car park that I realised it was at maximum capacity! I’d not seen this even in the summer. Two mini buses – apparently from a school in Bruton near Barnstaple – demanded large spaces and so, I can only assume there was an event, of sorts, taking place on this day. 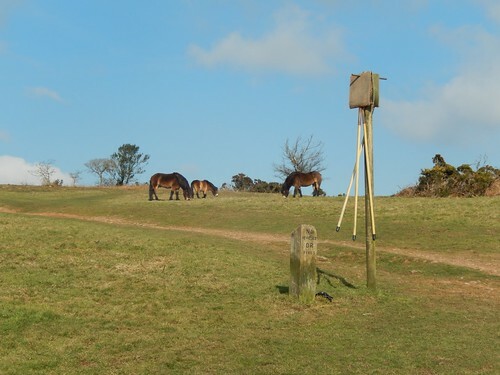 A few metres on, through the kissing gate and leaving the cars behind, I did find horses. 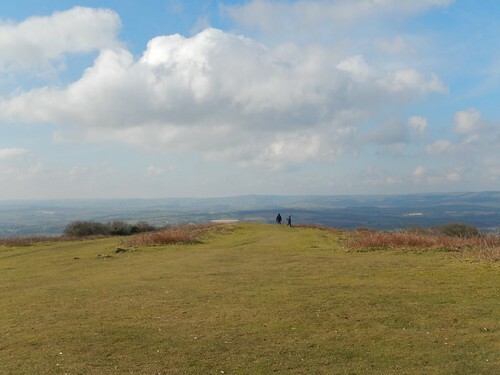 Lydeard Hill never lets you down! 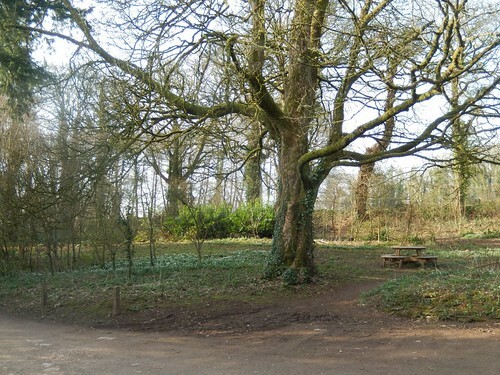 There were kids playing in the trees, dog walkers heading towards me and runners occasionally overtaking from behind. 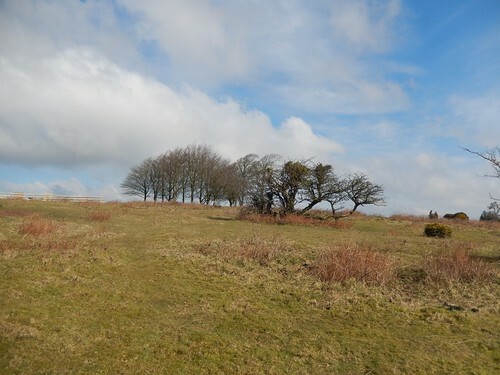 Despite existing as a separate hill, it doesn’t take much of an ascent to reach this point from Cothelstone Hill. 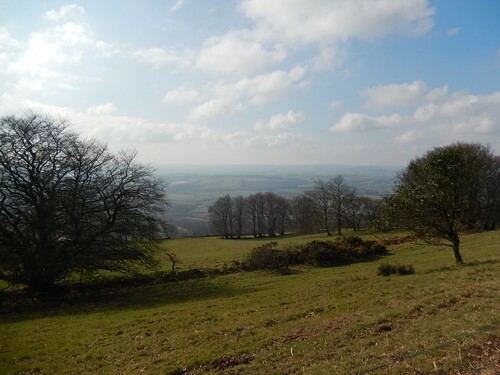 A little bit further on and I would reach Wills Neck, the highest point on the Quantock Hills. 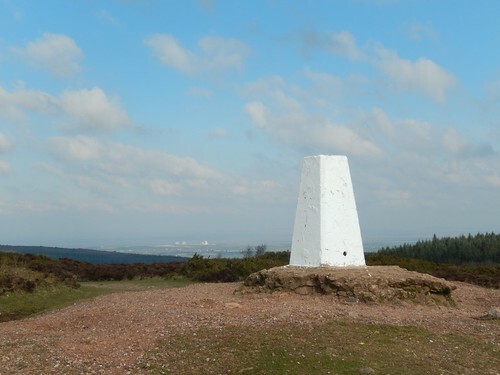 Presented with a choice of two paths, I picked the wrong one, leading along the southern face of the hillside before then having to climb up to the trig point. Do not let those blue skies deceive you, for it was as bitterly cold here as anywhere else on my walk so far. Of course, this is to be expected when one is 384m above sea level. 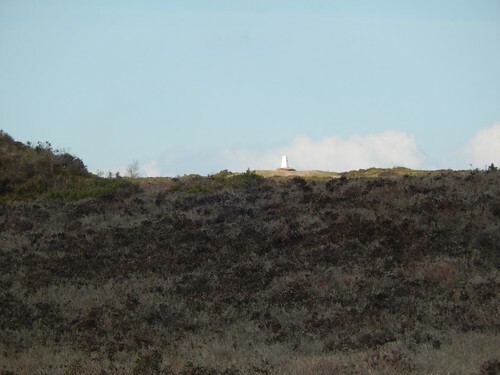 Marking the halfway point on my walk, I would choose to seek a windbreak slightly to the north, before continuing this adventure. But, in Part 2, we’ll see how the final half of the walk would pan out. Did I do it? 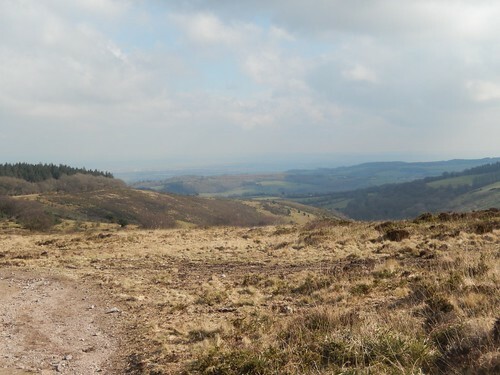 Could I create a twelve-mile circuit from Fyne Court to Wills Neck and back that didn’t involve wading through long grass, scrambling over wire or feeling at a loss with the folded sheet in front of me?